When we found out that the Come To Hamburg project had arranged for us to stay at the Holiday Inn Hamburg for our visit to the city we were really excited. 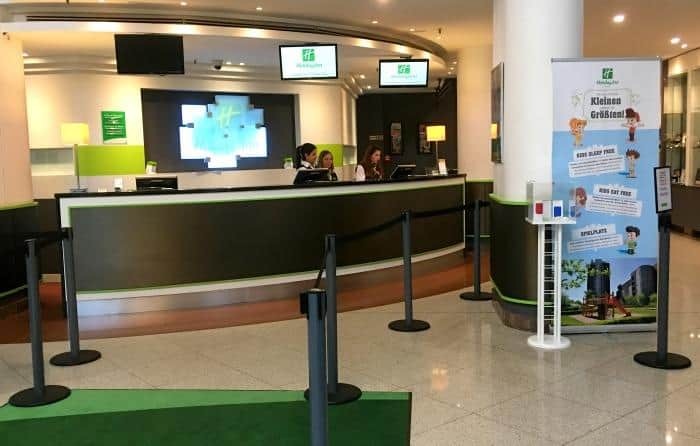 We have been lucky enough to stay with Holiday Inn a few times now, and we were also staying with Holiday Inn Express at London Stansted as our airport hotel for this particular trip so it all fitted together really well. The Holiday Inn Hamburg is situated just outside of Hamburg, but do not let this deter you from booking your stay here. It’s very easy to get to the hotel both from the city and the airport. We caught the S1 from the airport to Hamburg Central Station then took a short walk to the bus station. We caught the number 3 bus which took about 15 minutes and dropped us 2 minutes walk away from the hotel. We had a Hamburg Card which gave us access to all public transport for 3 days, and is a must have for any short break to the city. As we walked towards the hotel, which you cannot miss from the bus stop by the way, we could see people standing outside looking up. I could see the building was tall, but what on earth could be so interesting to gather so many people? Then it became clear! There was someone abseiling or walking if you like, down the front of the building face first. 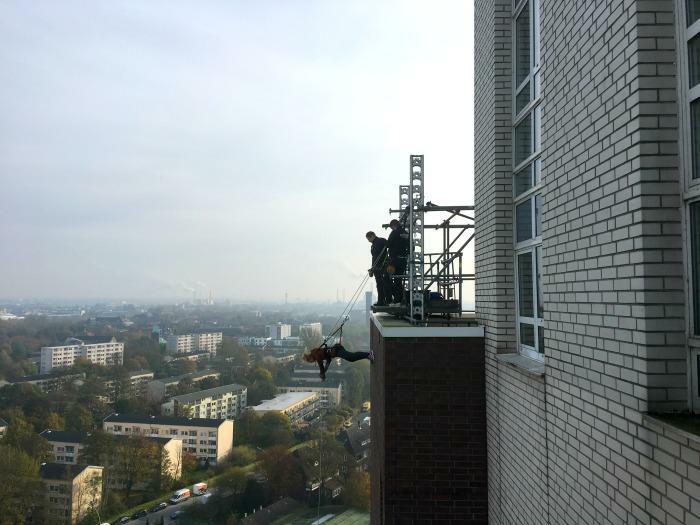 It turns out this is an activity that thrill seeking guests can book at the hotel, but I’ll be honest, I had everything crossed that they weren’t going to ask me to review it! Check in was smooth and straight forward, and I was delighted to hear that our Executive Room on the 16th floor was ready. The moment you walk into your hotel room is critical, and sets the tone for the entire stay. Seeing as I was travelling with my 3 year old daughter, we were going to be spending a lot of time in the room, especially in the evening. Young kids still need to have their bedtime routine even when they are away I find. Our room was lovely, with lots of space for the two of us, and some gorgeous features. The bathroom suite was an excellent size and had a bath with overhead shower. There was plenty of lighting, mirrors and a good stock of white fluffy towels, which is incredibly important. Our room was also air conditioned which made the room temperature very easy to control. We had robes and towels provided to use in the hotel spa and swimming pool as well as access to the complimentary mini bar. The decor was incredibly stylish with gold trim and black features. 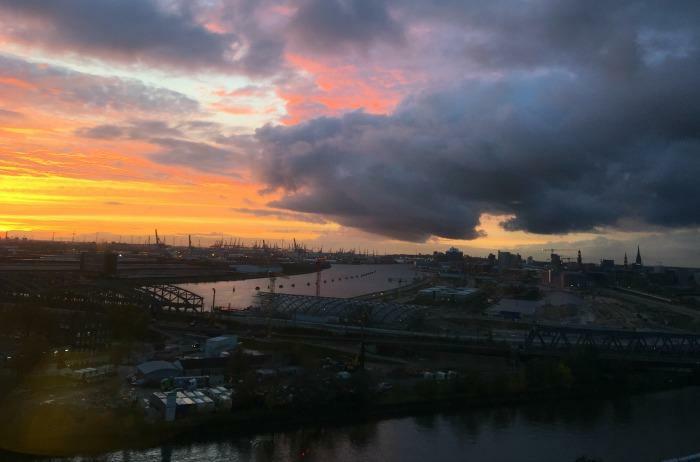 I later found out that the hotel was designed with a cruise ship in mind to reflect the port of Hamburg and it’s location close to the river. The hotel room reflected this style also, which I really enjoyed. One of my favourite aspects about the room was the view. 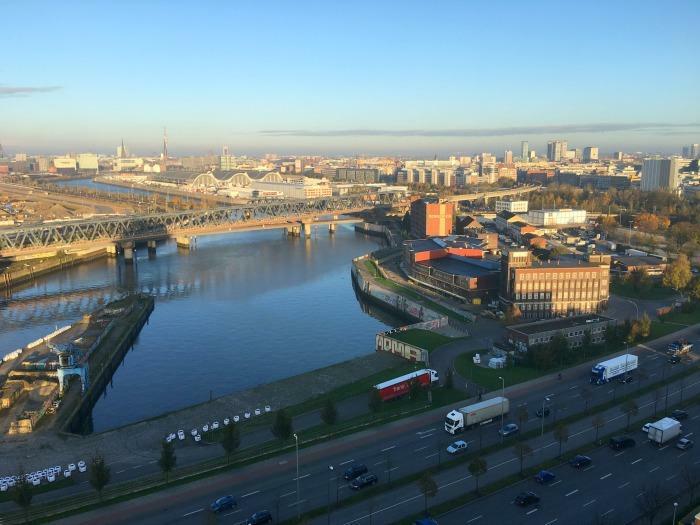 As we were on the 16th floor we were able to enjoy stunning views across the river Elbe and city of Hamburg. Sunset was particularly spectacular in the evening and you could see for miles on a blue sky day. If I could have made one improvement to our room it would have been to have access to a few more English speaking channels on the TV. This was really for my daughter, who does like to watch cartoons in the morning and the evening before bed. 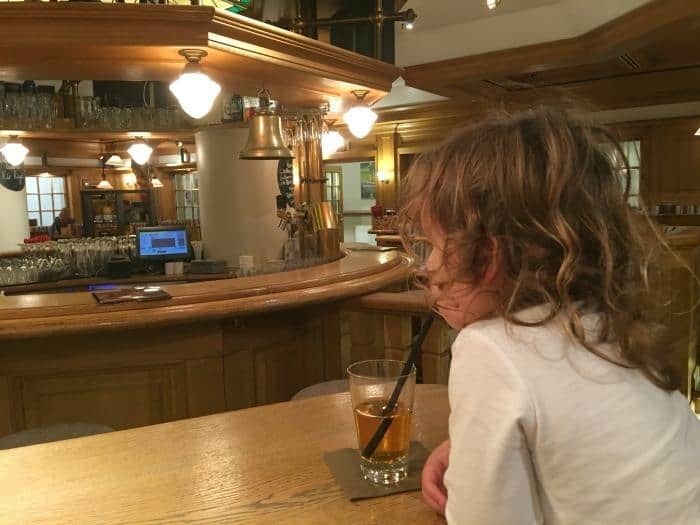 Fortunately, she seemed to enjoy the Disney channel in German, so we managed to get by. The Holiday Inn Hamburg offers a great range of facilities for families who want to stay here. When I looked on their website I was really impressed with what was on offer. The hotel swimming pool is available for families to use at set times during the day. Also, if you wish to use the pool without the children, there are adult only swimming times. 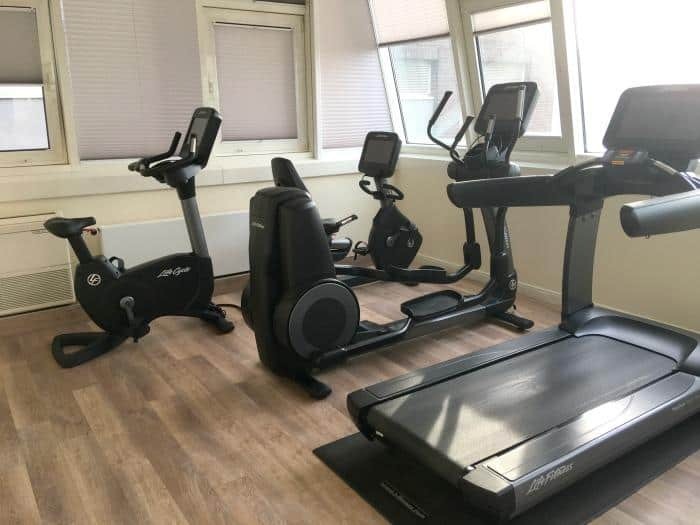 There was also a small gym facility for hotel guests to use that included running machines and bikes. Outdoors there’s also a park owned by the hotel perfect for jogging, and the website mentions there’s a child’s play area, but we didn’t get chance to use it. The hotel has a restaurant and a pub for guests to use in the evening as well as a relaxing lounge area. We used both the restaurant and pub during our stay as it was convenient for us to eat our evening meal here instead of in the city of Hamburg. The pub has a very Bavarian feel and provides a relaxed dining experience for families. There’s a small range of snacks and meals on offer to choose from. Children under 12 years old eat free both here and in the restaurant with Holiday Inn. The children’s menu is quite limited with just 3 options. It is child friendly, but unfortunately there wasn’t anything on it that my daughter would eat. I asked if my daughter would be able to have an omelette instead, and unfortunately the kitchen wasn’t able to help me with this request. I felt this was a real shame, as I think families really appreciate a little flexibility especially when it comes to eating out. During our stay, we were also lucky enough to be given a private tour of the hotel. One aspect that really stood out to us was the roof top. We got an exclusive peek on the 18th floor, without having to jump off it I hasten to add, to see the panoramic view of the city. It would be lovely to see this area developed into a hotel bar and restaurant as the views are simply stunning. It would be an amazing place to enjoy breakfast, an evening meal or even a few drinks and I think potential guests and visitors to Hamburg would really enjoy it too. Breakfast was a whole different ball game, and there were plenty of options that both my daughter and I enjoyed. Breakfast is served in the hotel restaurant which overlooks the river. We were able to enjoy breakfast in different parts of the restaurant on both days and our favourite was definitely the private buffet area. It was incredibly stylish and the black and red decor flowed from the bridge across the river Elbe outside. The pictures of Hamburg were a lovely feature, as well as the views. In this breakfast room you have access to a small buffet, and are able to navigate your breakfast away from the majority of hotel guests. If you are not one for crowds, this is a great choice. On the opposite side of the restaurant you can also enjoy the river views in a much lighter environment while having access to the entire buffet. I was very impressed with being able to enjoy breakfast until 12 noon, making brunch a real option if you wanted a lie in. Unfortunately my 3 year old hasn’t quite grasped the idea of lying in bed yet, and we were one of the first down to breakfast both days. There was a good selection of cereals, cooked breakfast, and fruits and juices for breakfast. 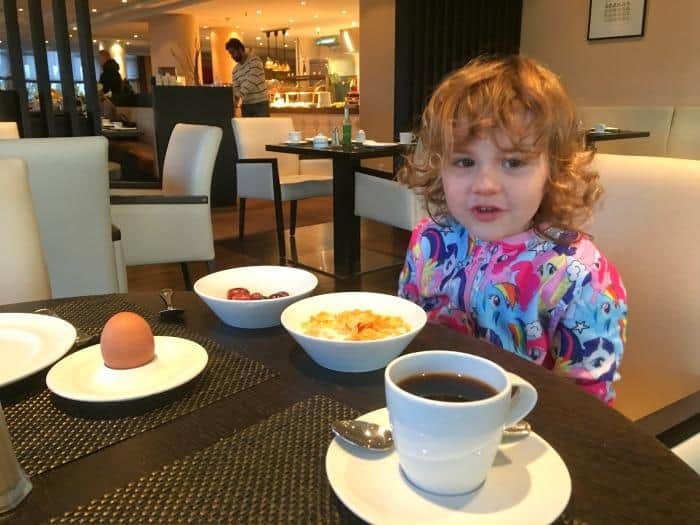 It was a good opportunity for me to get a good meal into my daughter and I before we started our busy day sightseeing around Hamburg. The staff at Holiday Inn Hamburg are incredibly friendly and helpful from breakfast service right through to check out. We were given a very warm welcome when we arrived at the hotel and they made sure we knew we could ask for help and assistance at any time. The service in both the restaurant and the pub was friendly and efficient, and our food and drinks orders came to our tables quickly which makes a difference when you have young fidgety children in tow. Our hotel room was spotlessly clean every day during our stay also. We had a small issue with the bathroom sink which was resolved straight away so it didn’t cause any further inconvenience during our stay, which was fantastic. If we needed help like getting directions to different attractions or even finding a treat for my daughter who desperately wanted a lolly pop, the staff couldn’t do enough to help us. 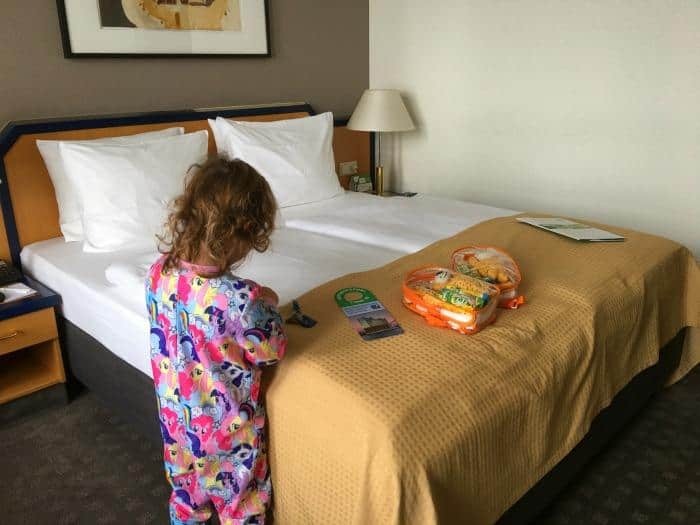 The only issues we experienced around the hotel service was eating in the evening, and I would love to see Holiday Inn look at this and offer some flexibility to take account of children who aren’t fans of chips or chicken nuggets. We found the Holiday Inn Hamburg to be an excellent base for our city break. The Executive Room was the perfect choice for a very relaxing stay, especially during the evening when my daughter was in bed. We really appreciated the air conditioned room, the complimentary mini bar, the size of the room and the stunning views. The free wifi in the hotel was also excellent. We felt the staff generally were very welcoming and helpful, and really helped us to enjoy our stay at the hotel. The distance the hotel was from the city worked well for us, as we found the hotel to be very peaceful away from the main hustle and bustle of Hamburg. Access into the city via public transport was excellent with buses for example running at least every 10 minutes and there was also a subway station near by. Holiday Inn could really take the experience at this hotel to the next level by offering more choice for children at meal times and to develop the roof top into a bar and restaurant for hotel guests and visitors. I suspect given the views it has over the city that it would be incredibly successful. 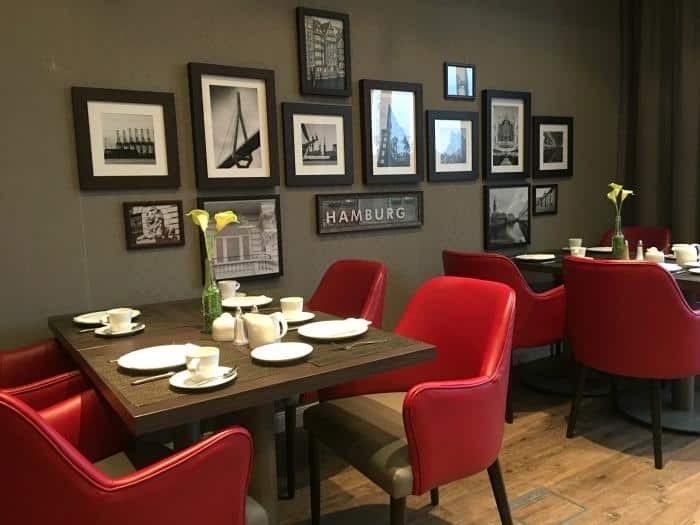 We were provided with a complimentary stay at Holiday Inn Hamburg as a part of the Come To Hamburg campaign, but all thoughts and opinions are our own. We stayed in an awful dingy apartment when we stayed in Hamburg that was miles from anything. It was awful. I will definitely keep this in mind for our next visit. The accommodation is so important. I bet that view is stunning – very important in a city like Hamburg. Shame they couldn’t have sorted something out for your daughter – that seems a bit short-sighted of them. Sounds like a great stay them views look stunning. Shame there wasn’t much food wise for children. This is a great account of the accommodation – the views are amazing and it’s great the staff were very accommodating. 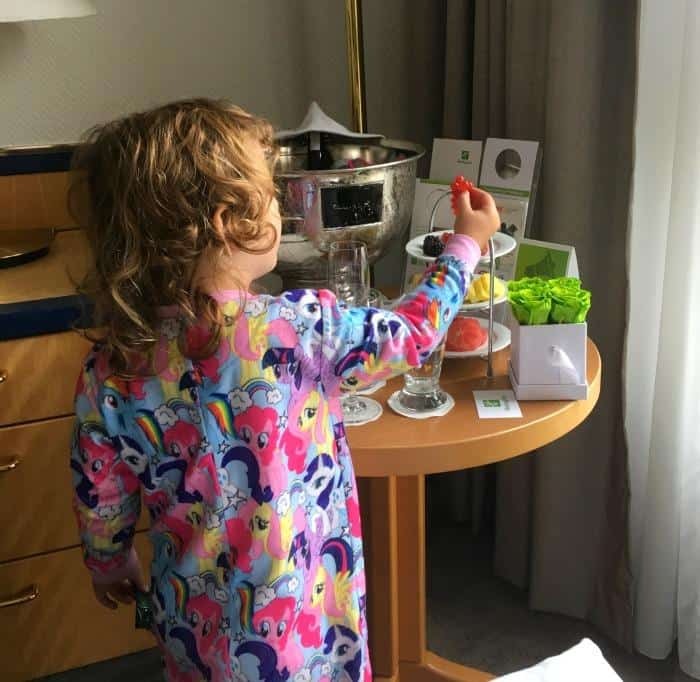 It’s also really useful for the hotel chain to know how they can improve families’ stays – being flexible and catering to young kids, especially when it comes to food choices is really important. Happy kids = happy parents after all! Ah – one day we’ll get the chance to catch a last-minute breakfast, just before the buffet closes! But it did sound as though this was a nice place to stay with children. Helpful friendly staff always help. Plus a nice view! I find the issue of children’s meals is so tricky. very few places seem to get it quite right. This looks nice, I love a good hotel breakfast! Half the fun of staying away!! Dear Zena, we really appreciate your feedback! We are very happy that we got the chance to be your host in Hamburg the first weekend in November 2017. We love your review of our hotel and Hamburg. However we really regret that your enquiry for an omelette was denied. This is not our usual standard. Thank you for your hint regarding the kids menu. We took this very seriously and acted immediately by enlarging our kids menu in a healthy way. For your next stay we would like to invite you and your daughter to enjoy an omelette on the house in our restaurant “Elbgarten”. Oh here’s another good place to stay when visiting Hamburg. Sounds like a nice hotel. I have never stayed in a Holiday Inn hotel before maybe I should try. I’ve never stayed in holiday Inn before, I’ve tried 2 of the other short stay hotel groups out there. Certainly sounds like I should try them sometime and see for ourselves. Sounds like a great stay them views look stunning and lovely rooms and facilities, images are awesome.